Trauma: some cases develop at the site of a recent minor injury, such as a pinprick. 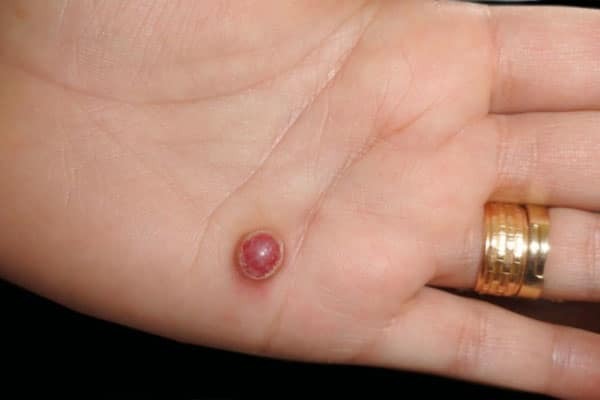 Lesions usually first appear as a small pinhead-sized red, brownish-red or blue-black spot that grows rapidly over a period of a few days to weeks to anywhere between 2mm and 2cm in diameter. Occasionally they may reach up to 5cm. They bleed easily and may ulcerate and form crusted sores. Usually a single lesion is present but in rare cases groups of multiple lesions may develop. Lesions most frequently appear on the head, neck, upper trunk and hands (especially fingers) and feet. The pregnancy variant of pyogenic granuloma most often occurs on the mucosal surfaces inside the mouth. The condition is usually painless with most patients mainly complaining of recurrent bleeding from the lesion. Pyogenic Granuloma affects people of all races. In general, women are affected more often than men because of the link with pregnancy. It rarely occurs in children less than 6 months old but is common in children and young adults. How is Pyogenic Granuloma Diagnosed? What Treatment is Available for Pyogenic Granuloma? Pyogenic granulomas in pregnant women may go away on their own after delivery so waiting is the best strategy in these cases. If due to a drug, they usually disappear when the drug is stopped. Recurrence after treatment is common because feeding blood vessels extend deep into the dermis in a cone-like manner. In these cases, the most effective method of removal is to cut out completely the affected area (excision), and then close with stitches by the hands or our expert dermatologists.